A particularly charming and manageable property in a beautiful rural setting, enjoying great views across the valley and out to the Mediterranean. The property is situated on a 1,917 sq.m. parcel of land, gently terraced and planted with olive trees, agaves, oleander, and many other Mediterranean shrubs. The access road leads straight to the off-street parking area, adjacent to a spacious stone slab courtyard. The main house is to the right and a guesthouse and a sitting area with summer kitchen is situated to the left of the courtyard. 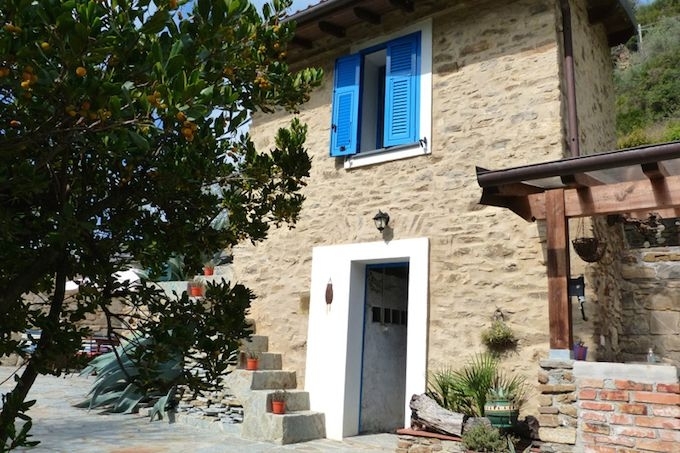 Both houses were built in the traditional Ligurian style and recently renovated. The main house, a former chapel, offers 62 sq.m. of living space, split over two levels. The main entrance, which opens straight into the comfortable living room with open fireplace, is located on the upper floor level. From here, there is a dining room and a small but well-equipped kitchen. A well-crafted spiral staircase connects with the lower floor level with its stunning 4m high vaulted ceilings. On this floor level we have the bedroom with gallery and a shower room. A private exit opens out to the roof covered terrace and the grounds. The guesthouse offers a storage room and toilet on the ground floor and an exterior staircase connects with the bedroom on the upper floor. The interior finishing in both houses is of a very high standard and enhances the rustic charm of the buildings. The floors finishes are terracotta tiles and antique slate slabs, and the timber windows are fitted with insect protection and shutters. The open fireplace and portable electric radiators keep the house warm during the colder season and hot water is provided by an electric boiler. It would also be possible to install a central heating system. The neighbouring village of Perinaldo with its selection of restaurants and shops is only a short 1.2 km drive away, and the coastal resorts of Vallecrosia and Bordighera can be reached within 20 minutes. The international airport in Nice is an hour’s drive away.